WE HARVEST STRAWBERRIES in spring and pull off the road to buy them at farm stands or, if we have to, in stores. Folks up north have to shovel their cars out or take a bus or trudge to a store for our berries. The first strawberry festival was held in 1858 in the Boston suburb of Belmont, Massachusetts. Shortcake was an early favorite, so were strawberry fool, strawberry buckle, strawberry slump, strawberry grunt, and strawberry flummery. They were all puddings of a sort. Back to the present. Since this is the time for frozen family and winter visitors to stay a while in Central Florida to warm up, it’s appropriate to share our red, juicy bounty with them. Strawberries are like potato chips … you can’t eat just one. So, when the chilly horde drops in, be ready to slice and dice a bunch of berries. There is a gadget called a strawberry huller. It’s like a pair of really fat tweezers. You jam it into the top of the washed berry, grab hold, and pull the hull out. That’s if the berry is all red. It doesn’t work well with white-topped berries that are hard. They need a knife. Put the chilly horde to work on a flat of berries. A flat has 12 pints, that’s a dozen of the little green baskets, or six quarts. But have you ever seen a flat where the berries are packed flat? They are almost always heaped up so it can’t hold one more. I weighed a couple of flats last year and they came in at about 11 pounds. Florida berries can be impressive. Just four from a one-pound package from my fridge weigh 8.4 ounces, more than half a pound. You can count on slicing and dicing some of those monsters. The folks at the Florida Strawberry Festival in Plant City know how to serve a bunch of folks by having a bunch of other folks do the work. You can try the same technique at home to serve a crowd. STRAWBERRIES AND CREAM is simple. Figure on about a half a pint of berries per person. Wash them. Hull them, slice them, sprinkle with white sugar to taste, and let them sit for an hour or so in a nice big bowl. Now pour on the cream and toss them gently with a big serving spoon. You’re done, except for doling them out in bowls. Leave some for seconds. CITRUS is still in season and impresses the devil out of the visitors, but it’s a pile of work to section enough oranges for a crowd. Instead, take a big platter and cover it with peeled orange slices; now, top the slices with fresh hulled strawberries. You might have to cut some of the monsters into bite-size pieces. Drizzle the whole thing with plenty of DARK CHOCOLATE syrup and sprinkle with shredded coconut. Give each person a fork and have a pile of napkins handy. An easy variation is to give each person a bowl of chocolate syrup and let them dip away. Don’t hull the berries or slice them if you don’t have oranges. People can pick berries up by the green part and dunk them in their bowl of chocolate. HOMEMADE CHOCOLATE SAUCE is simple to make as plain or as fancy as you like. Heat 12 ounces of evaporated milk in a heavy pot. Add two cups (a 12-ounce package) of semi-sweet chocolate chips. Stir until the chocolate is melted. Stir in two teaspoons vanilla extract. You’re done. And you have about two cups of sauce. You can use regular milk in place of evaporated, but it won’t be as rich. Fancy it up by using flavored chips — peppermint, peanut butter, caramel … whatever you can find. Sneak in a drop of bourbon for adults. If you have a bunch of folks at breakfast, set up a production line for STRAWBERRY PANCAKES. Toss a handful of chopped berries on each pancake and let them sink in a bit before flipping. 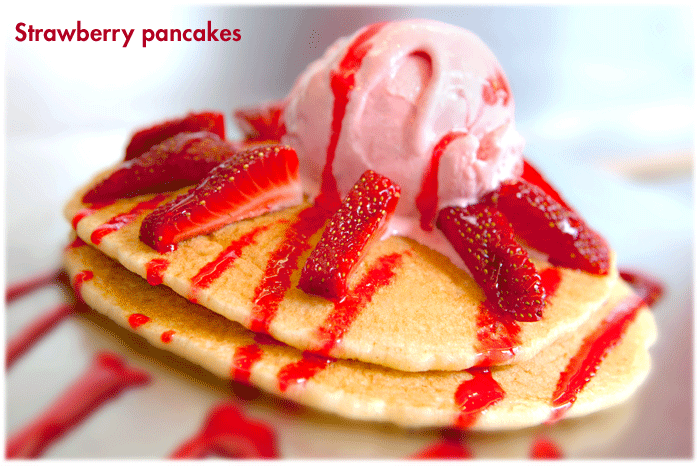 Serve with warm strawberry jam instead of pancake syrup. A bunch of our strawberries will give a crowd something to boast about when they get home. Trent Rowe is the food editor for Central Florida Ag News.